Pah Bah 2017: Thank You! During the formal part of the ceremony, sponsors Sunny Souriyavong and Issaree Photiruk (known as Dang), made the traditional Pah Bah offering of cloth from which the monks make their robes. As many of you know, Sunny and Dang’s generosity extends far beyond their sponsorship. They offer meals to the monks many times each year and always bring tons of wonderful food to the Pah Bahs. Thank you, Sunny and Dang. Thank you to Luang Por Pasanno, Ajahn Siripanyo, Ajahn Sek and other Abhayagiri monastics and lay stewards for coming up for the Pah Bah! Some 60 – 70 people attended the Half-Day Retreat on Saturday. About 110 attended the actual Pah Bah on Sunday, and over $27,000 was donated in support of the Pacific Hermitage. Thank you for your generosity! The Kids Brought Smiles to All! 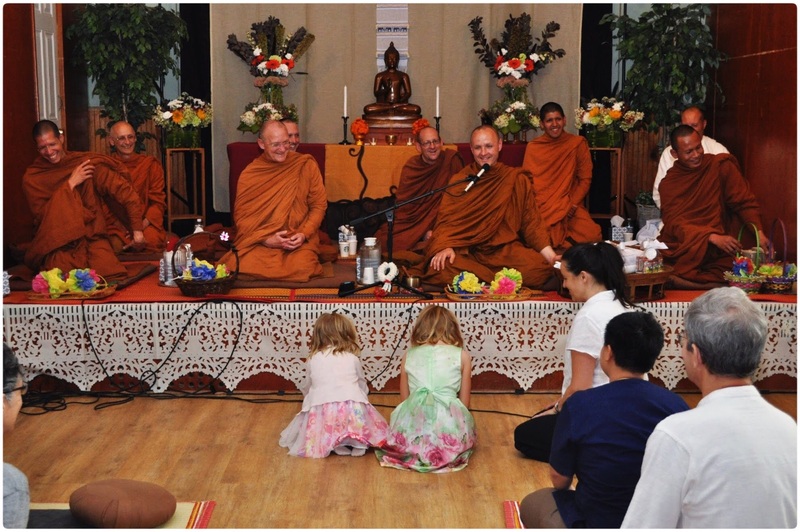 The Kids’ program this year was a real hit, with children offering trays of paper flowers and then bowing to the monks. It was cute, sweet and brought smiles to everyone’s faces. Thank you to Jessica Swanson for coordinating the program. Look for an official thank you and an overview of the year in a letter later this year from Sanghata, the board of stewards for the Pacific Hermitage. If you’re not on the mailing list, but would like to receive Pacific Hermitage emails or postal mailings, please fill out the form at the bottom right of this page.